The Azusa Pacific Distance Meet of Champions sponsored by adidas will be held this weekend with automatic berths in the adidas Dream Mile on the line for the top two finishers in the invitational mile races. Despite being an early season competition, this meet brings out many of the best in the West coast to roll out some quick times in March. With potential tickets to be punched or the adidas Dream Mile (scheduled for Saturday, June 14th at Icahn Stadium in New York City), national leading times are bound to be produced. Austin Tamagno of Brea Olinda High School ran remarkably under 4:10 last spring as a freshmen at the California State finals with a third place finish. Tamagno finished in the top 20 at the Nike Cross Nationals this past December. Tamagno won the Mt. Sac Invitational this fall in a sophomore class record time of 14:34 on the historic course. Tamagna placed 5th in last year's adidas MOC 1600 race. Garrett Corcoran is the current US outdoor leader in the 3200 from his 8:58 performance last weekend. The Villa Park senior last outdoor season finished 6th in the California state meet finals of the 1600. The 2013 Foot Locker All-American after a 14th place showing at Balboa Park in December is seeking his first sub 4:10 time this weekend after running a personal best last spring of 4:10 at the Orange County Championships. Corcoran is the top returnee from last year's Meet of Champions when he finished runner-up to Blake Haney in a time of 4:13.45. Tal Braude, a senior at Torrey Pines High School, was a California state champion this past fall and ran a top 5 al-time performance on the Mt. Sac course as well in the fall season. His 1600 best sits currently at 4:15, but will be looking to lock up with guys like Tamango and Corcoran to see if he can approach a time closer t0 4:10. Arcadia's Esteven De La Rosa has consistently been one of the top distance runners in his state and this past winter exceled in a extended cross country season of races in Scotland at the Great Edinburgh Run as well as the USA Cross Country Championships in Boulder. He finished 7th for team USA most recently in the NACAC Championships with a 18:48 6K performance. De La Rosa's teammate Phillip Rocha is actually the better proven miler of the two. Rocha ran 4:17 in last year's race, while most recently at the Irvine/Asics Invitate last Saturday posted a new personal best time of 4:14.99. He may be the sharpest racer in the field currently. San Pedro senior Steve Correa is another in the field with a time of 4:15 or better. After running a 4:17 mile in an unseeded section of the Arcadia Invite, Correa is looking to position himself to get into the seeded races and much more high profiled races this outdoor season. Tamango is the not the lone Brea Olinda High School stud miler in the field. Senior teammate Brennon Koryta owns a 4:13 lifetime best from his Southern Sections performance last year. Nick Doan of Great Oak has already had a successful March and is looking to continue that trend into the Meet of Champions mile. Doan has run 4:17 for 1600 and even more impressive 9:05 for 3200 meters this month. The Great Oak junior also has some wheels with a 1:55 open 800 this month. Emma Abrahamson is the top seed in the girls field after already running 4:55 in the 1600 this spring, while the La Costa Canyon senior also owns a 4:51 personal best from the 2013 outdoor season. She has been running sub 5 minute miles since her freshmen year of high school including a victory of 4:57.66 at the California State Indoor Meet in February for Vanderbilt signee. Great Oak High School brings two top individuals into the race between Haley Dorris and Ashley Helbig. Dorris has a nearly identical season best to Abraham in the first few weeks of otudoor with a 4:55.70 1600 performance at her home invitational on March 15th, which was her first time venturing under sub 5. Dorris has also ran a 3200 PR of 10:40 this season. Ashley Helbig is the second sub 5 miler for Great Oak as she was just behind teammate Dorris at the Great Oak Distance Invite in 4:56, while also having a handful of prior sub 5's from last outdoor season. 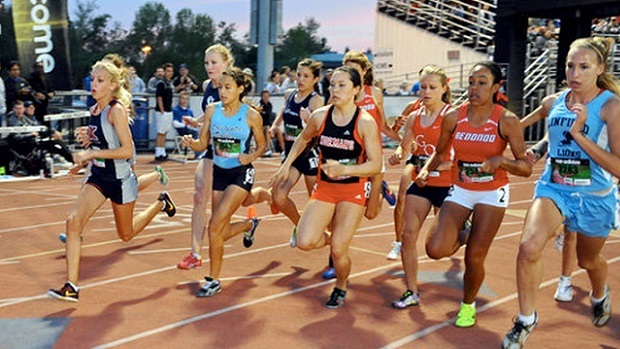 Lisa Vasquez, a junior from Downey High School, just missed sub 5 in the Southern Sections last spring and ran 10:51 in the 3200 at the 2013 Arcadia Invitational. Corona's Alicia Williams is the top returnee from last year's adidas Azusa Meet of Champions when she turned in a sixth place effort of 5:00.42. Arcadia senior Veronica Yamane is looking to build upon a sub 18 minute 5K performance in cross country at the Stanford Invitational and venture close to 5 minutes flat in the race on Saturday. More on 2014 adidas Azusa Pacific Meet of Champions.